Glasgow was the perfect setting for the European Consortium for Political Research conference last week with the upcoming Scottish Independence referendum taking place in less than two weeks’ time and there was much discussion throughout the conference on the topic (it also inspired our recent post on The Dis-United Kingdom). Policy Press took part in the publisher exhibition displaying Policy & Politics and a wide range of related books for the 2,500 visitors to browse. 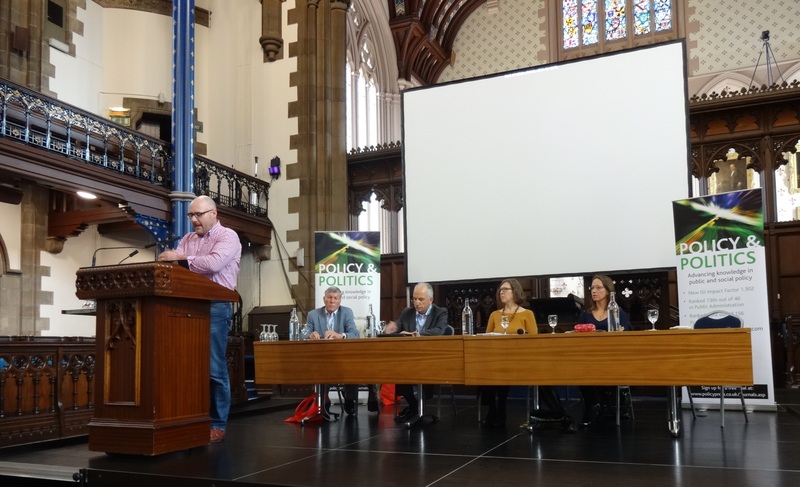 Policy & Politics was also the sponsor of the roundtable discussion on Democracy and its Discontents held on Friday in the beautiful Bute Hall at the University. Co-Editor of the journal, Matt Flinders was one of the Speakers along with Dirk Berg-Schlosser of the University of Marburg, Rosie Campbell from Birkbeck, University of London and Leonardo Morlino from LUISS University, Rome. Sarah Birch from University of Glasgow chaired the session which considered current issues in representation at national and European levels. The speakers reflected on the causes of challenges to representation and on how those challenges might be overcome. A lively question and answer session followed which covered a wide range of viewpoints. We’re already looking forward to next years’s conference in Montreal!